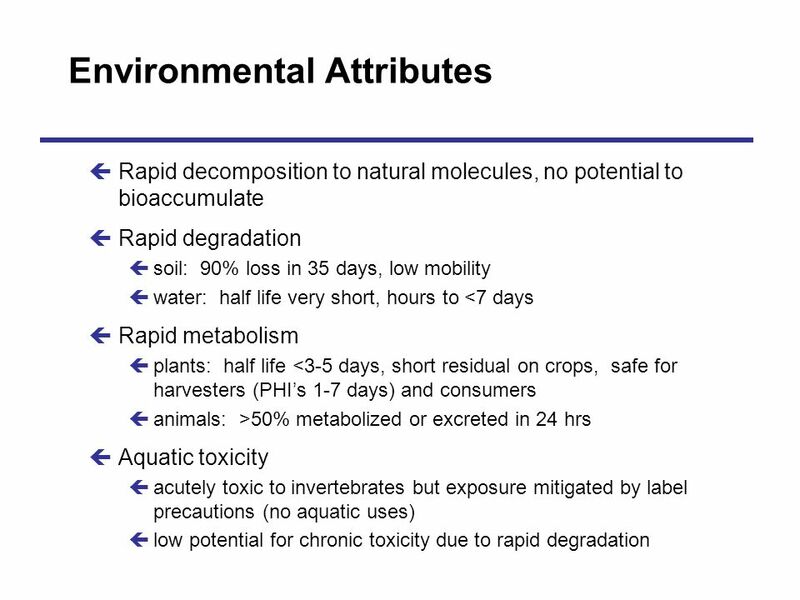 Rapid decomposition to natural molecules, no potential to bioaccumulate Rapid degradation soil: 90% loss in 35 days, low mobility water: half life very short, hours to <7 days Rapid metabolism plants: half life <3-5 days, short residual on crops, safe for harvesters (PHI’s 1-7 days) and consumers animals: >50% metabolized or excreted in 24 hrs Aquatic toxicity acutely toxic to invertebrates but exposure mitigated by label precautions (no aquatic uses) low potential for chronic toxicity due to rapid degradation Lannate does not accumulate in body and any adverse effect is rapidly reversible. Metabolites (acetonitrile & CO2) are eliminate primarily by respiration and urine. 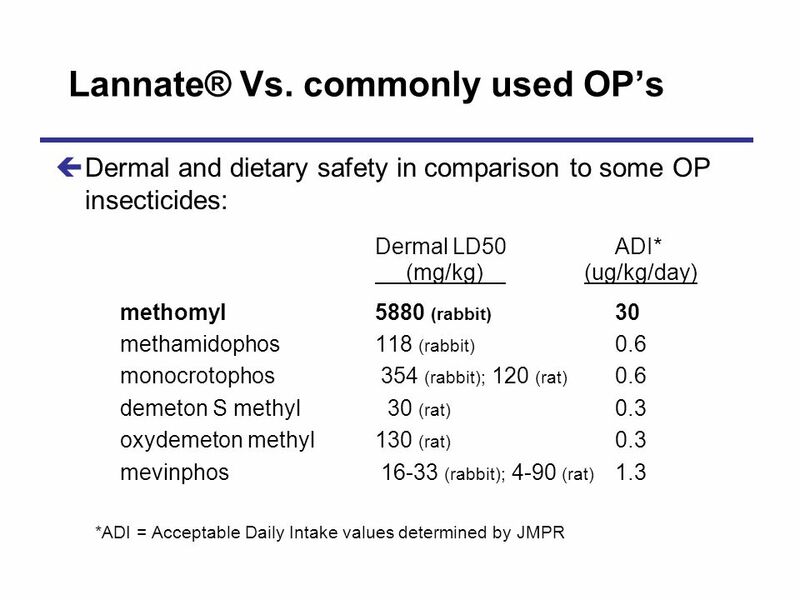 Dermal and dietary safety in comparison to some OP insecticides: Dermal LD50	ADI* (mg/kg) (ug/kg/day) methomyl (rabbit)	30 methamidophos (rabbit)	0.6 monocrotophos (rabbit); 120 (rat) 0.6 demeton S methyl	30 (rat)	0.3 oxydemeton methyl 130 (rat)	0.3 mevinphos (rabbit); 4-90 (rat) 1.3 *ADI = Acceptable Daily Intake values determined by JMPR UAE-united arab emirats banned products, very strict Do these products are still sold? Even in banned? 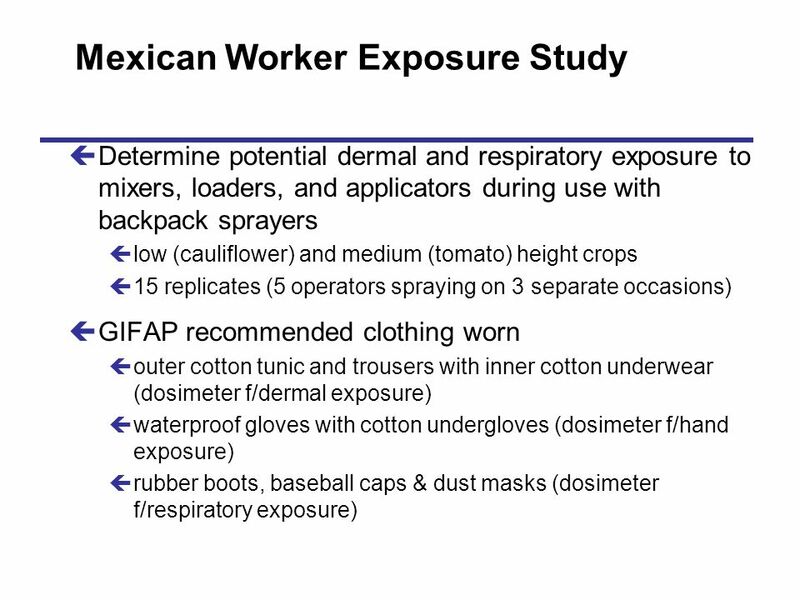 Determine potential dermal and respiratory exposure to mixers, loaders, and applicators during use with backpack sprayers low (cauliflower) and medium (tomato) height crops 15 replicates (5 operators spraying on 3 separate occasions) GIFAP recommended clothing worn outer cotton tunic and trousers with inner cotton underwear (dosimeter f/dermal exposure) waterproof gloves with cotton undergloves (dosimeter f/hand exposure) rubber boots, baseball caps & dust masks (dosimeter f/respiratory exposure) Patrick: Do Knapsack is the same as backpack sprayers? 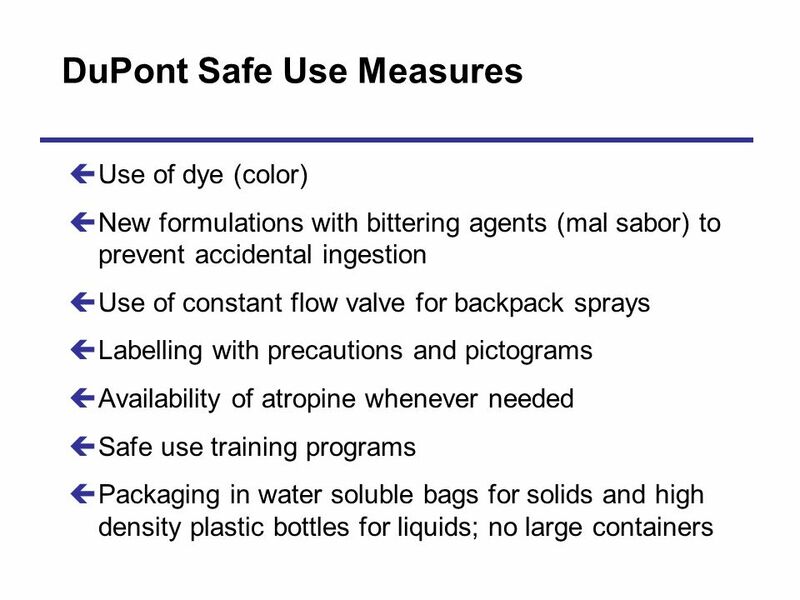 Use of dye (color) New formulations with bittering agents (mal sabor) to prevent accidental ingestion Use of constant flow valve for backpack sprays Labelling with precautions and pictograms Availability of atropine whenever needed Safe use training programs Packaging in water soluble bags for solids and high density plastic bottles for liquids; no large containers constant flow valve? Is that used in CA? 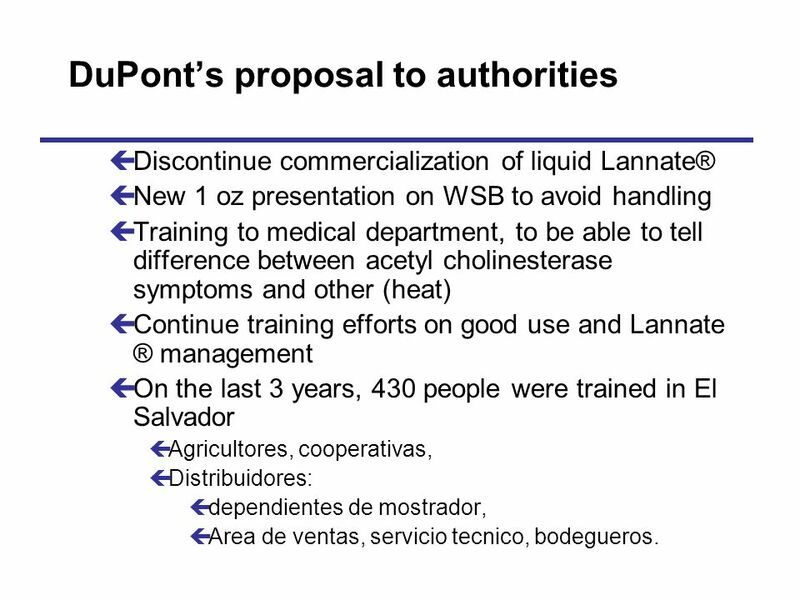 Discontinue commercialization of liquid Lannate® New 1 oz presentation on WSB to avoid handling Training to medical department, to be able to tell difference between acetyl cholinesterase symptoms and other (heat) Continue training efforts on good use and Lannate ® management On the last 3 years, 430 people were trained in El Salvador Agricultores, cooperativas, Distribuidores: dependientes de mostrador, Area de ventas, servicio tecnico, bodegueros. 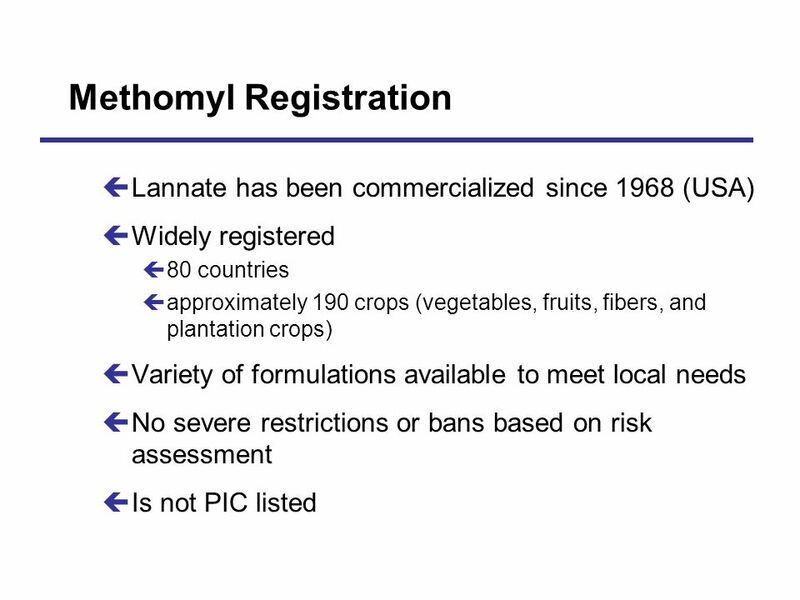 Download ppt "Lannate® Insecticide Registration Attributes"
Chlorpyrifos ENV H 572 Hilary Zetlen. 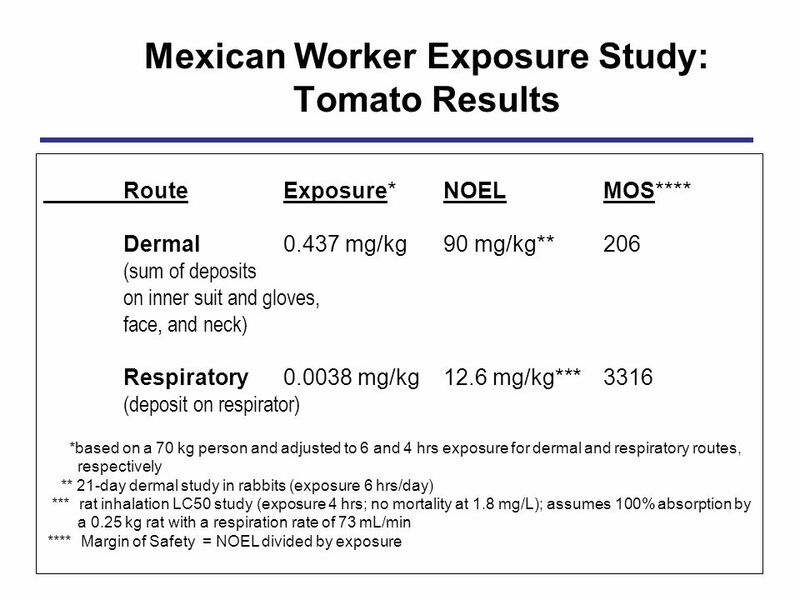 Chlorpyrifos  Organophosphate pesticide  Marketed by Dow Chemical since 1965  Domestic and agricultural uses.  Those hazards which may cause measurable changes in the body or its functions. 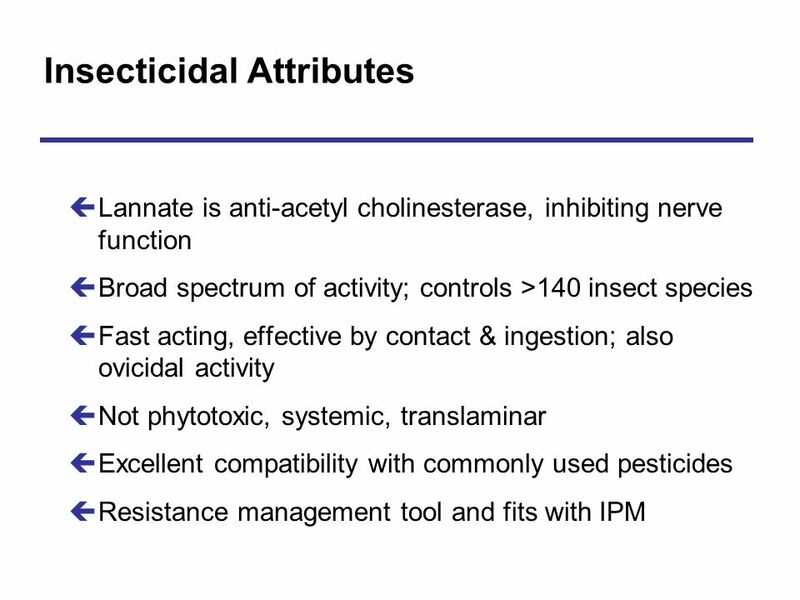 Pesticides in Clinical Care Part I. What is a Pesticide? A substance or mixture used for preventing, destroying, repelling, or mitigating any pest. A. Why the GHS is important for Public Health Joanna Tempowski Dept Public Health & Environment. 1 David Loschke18 March 2005 New Zealand Timber Preservation Council Annual Conference 2005 The Australian Pesticides & Veterinary Medicines Authority. EPA and Aquatic Pesticide Registration - No Unreasonable Adverse Effects on Man or the Environment Donald Stubbs. 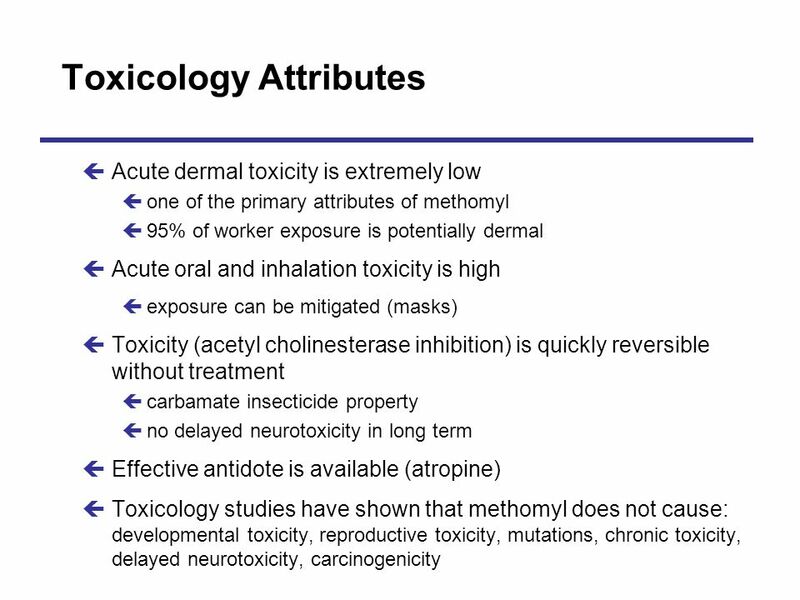 Mechanism and Symptoms of Toxicity, and Diagnosis of Cholinesterase Inhibitors Pesticide Health Effects Medical Education Database (PHEMED) 2010. Priority-setting for the Endocrine Disruptor Screening Program: Pesticide Active Ingredients Penelope A. Fenner-Crisp Office of Pesticide Programs U.S.
Kimberly Francis. 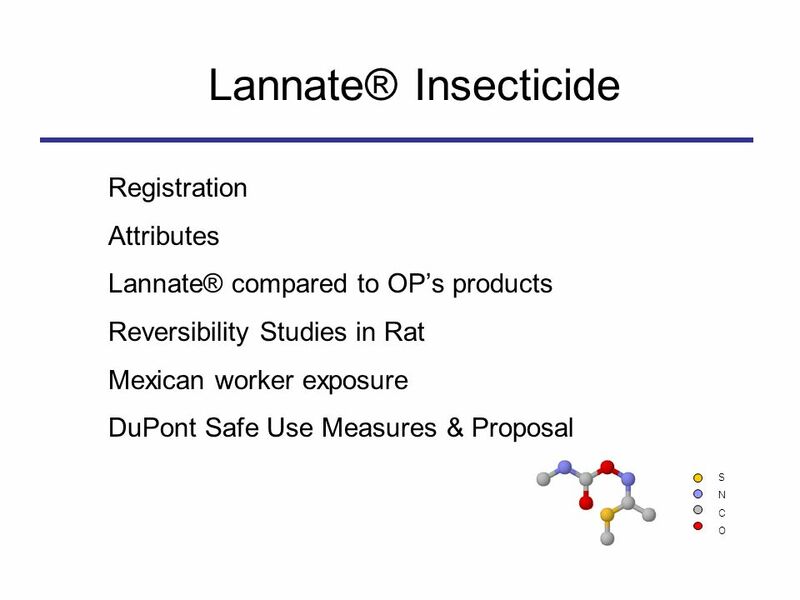 Dichlorodiphenyltrichloroethane (DDT) is a organochlorine contact insecticide that kills by acting as a nerve poison. Its insecticidal. Pesticide Out Of Control Bio Sci Spring 2006 By: Vivian Metry. 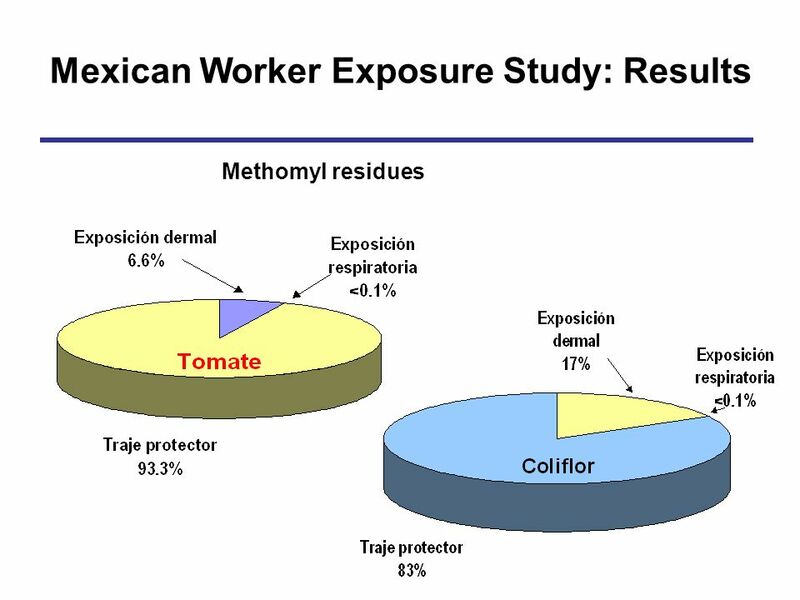 PESTICIDE LABELING Main method of communication between manufacturer and user Main method of communication between manufacturer and user Label: information. 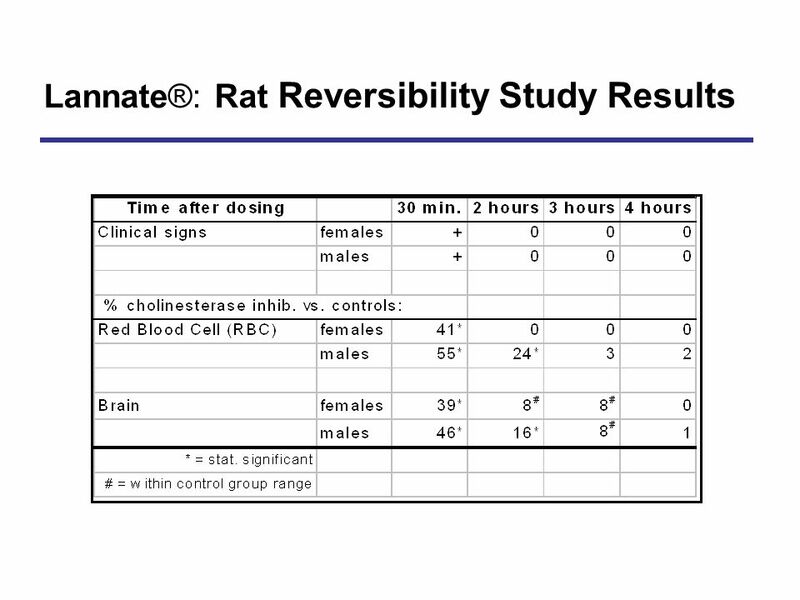 Chapter 23 Pest Management. 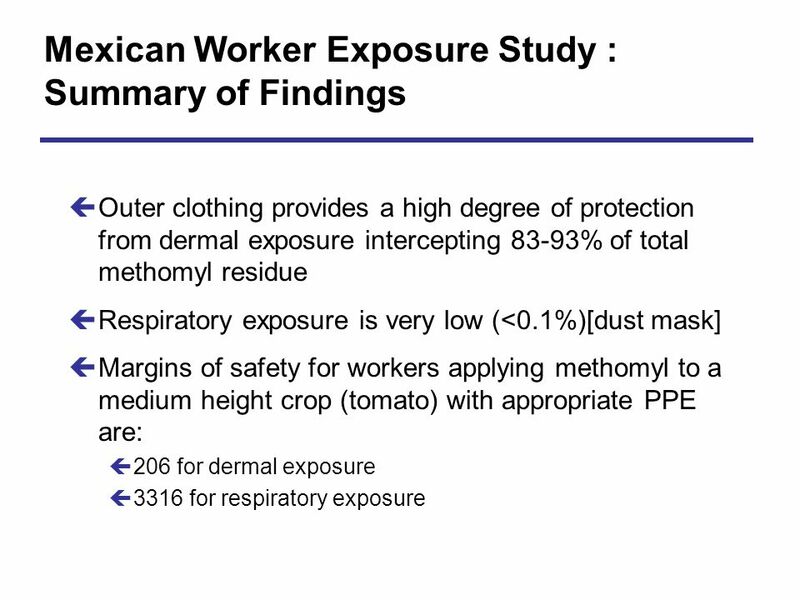 Overview of Chapter 23  What is a Pesticide?  Benefits and Problems With Pesticides  Risks of Pesticides to Human Health. Pesticide Labels and Labeling. Pesticide Registration Pesticide registration is a scientific, legal and administrative procedure conducted by EPA. 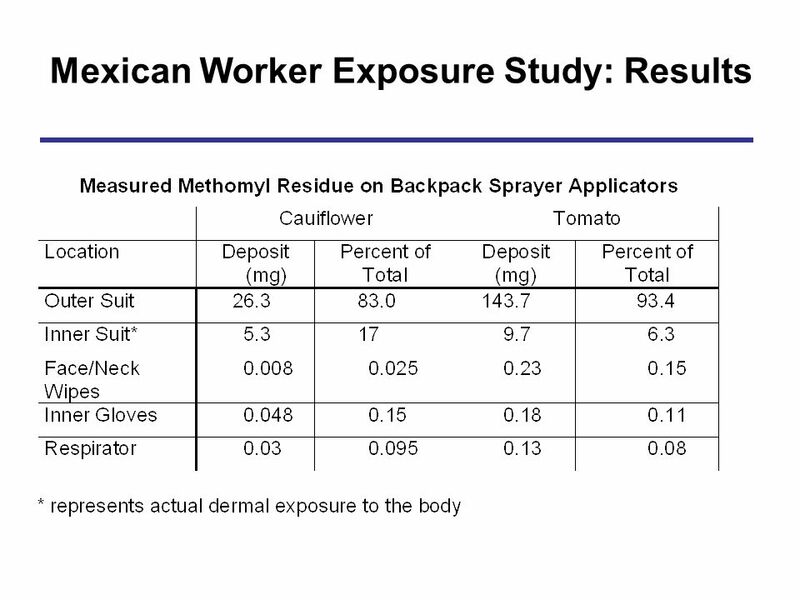 Safe Herbicide Use Environmental Consequences Social Concerns Max Williamson. Pesticide Hazards and First Aid Fred Fishel UF/IFAS Pesticide Information Office Department of Agronomy.